The Ambulance Americaine became a focal point of another controversy: the ethics of war and care for the wounded. In 1916, a series of graphic essays about an American nurse’s experience appeared in the Atlantic Monthly. 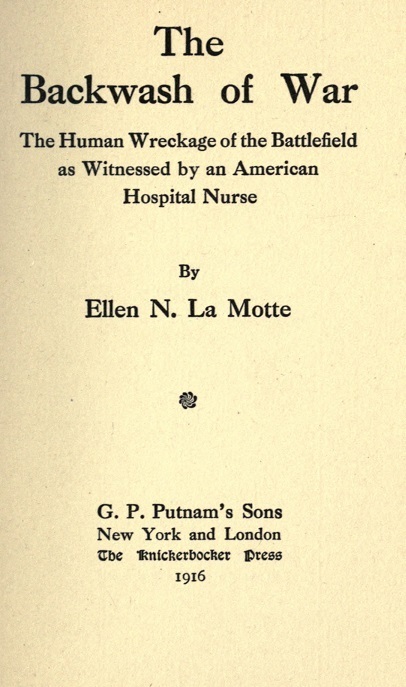 They were eventually packaged into a full monograph, The Backwash of War: The Human Wreckage of the Battlefield as Witnessed by an American Hospital Nurse. The author, Ellen La Motte, was a 1902 graduate of the Johns Hopkins Hospital Training School for Nurses and a former tuberculosis nurse in Baltimore. 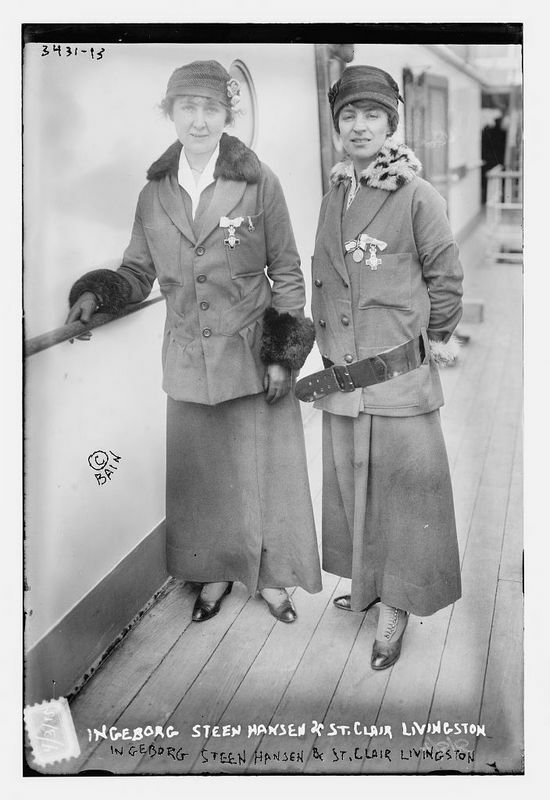 She volunteered to work in France from 1914 to 1916. La Motte was not interested in sentimentalized portraits of wounded soldiers and heroic doctors. Rather, her essays amounted to a frank and powerful critique of the war. “Backwash” referred to the ugliness churned up in the wake of the war. La Motte portrayed the hospital as a scene of corruption, distress and callous violence inflicted on suffering soldiers. The excerpt here is taken from La Motte’s vignette “Heroes,” a story centered on the ethics of suicide and treatment during war. The Backwash of War triggered a public outcry. While the book sold well in the United States in 1916, it was banned in Great Britain and France. It would also be banned in the United States after Wilson declared war in 1917. Public criticism, at that point, was no longer an option. War fervor became a civic duty. The Ellen La Motte Collection is available at the Alan Mason Chesney Medical Archives. To learn more about the careers of Hopkins nurses who traveled abroad before 1917, please visit the Johns Hopkins Training School for Nurses portion of this exhibit. La Motte was not the only Hopkins nurse to publish a anti-war book. St. Clair Livingston, class of 1908, and Ingeborg Steen-Hansen, class of 1910, published Under Three Flags: with the Red Cross in Belgium, France and Serbia in 1916, recounting their experiences the year before.